Purchase "Butcher Knives & Body Counts: Essays on the Formula, Frights, and Fun of the Slasher Film"
From meat cleavers and machetes to summer camp carnage and sorority house massacres, from final girls and scream queens to demented deviants and dead teenagers, slasher films turned body counts into box office gold. It’s the oft-maligned — but surprisingly durable — sub-genre of horror films that uses a Freudian rulebook and bases the survival rates of its characters on vice and virtue. From the low-budget aesthetics of the 70’s and 80’s to the self-referential gloss of the 90’s and beyond, Butcher Knives & Body Counts will explore the archetype of the slasher film and trace its evolution from formula to franchise. 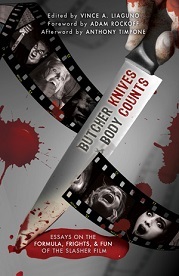 From the inventive kills and the gory intestine spills right down to the last tagline and toe tag, Butcher Knives & Body Counts will celebrate the enduring formula, frights, and fun of slasher movies. 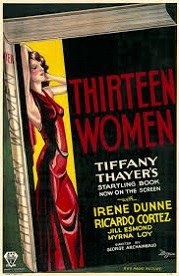 "One writer, R. B. Payne, submitted an essay claiming that THIRTEEN WOMEN, TERROR ABOARD, and THE NINTH GUEST, were really the first slashers. I'm blown away how people have intellectualized, gone back to those archives of film history, and found legitimate cases for the first slasher [film]."